Here is a progress photo of some of the new panels I’ve been working on for my local gallery. They are just about out of these, so I’ll be delivering a baker’s dozen or so to them tomorrow morning. I will be showing individual finished ones after I get them all scanned in. After the fun and creative parts are done, I get to put the wires on the backs, scan and resize images, and make a picture inventory in duplicate — one for the gallery to sign and one to keep. It’s been a busy week, so I apologize for almost missing this post. We had our monthly Brava meeting at my house this morning. It’s such a shot of creative energy to get together with a group of artists and talk about concerns we all have regarding our process, goals, exhibitions, galleries, and the art business in general. The group is comfortable enough with each other that we feel free to give constructive input and share our unique perspectives on a level that goes beyond cheerleading. After the meeting I worked on the paintings for the rest of the afternoon. My Saturday Finds might be a day late. Tomorrow after I deliver the paintings I am scheduled to canvass for Barack Obama the rest of the day. ie ..an and resize images, and make a picture inventory in duplicate — one for the gallery to sign and one to keep. Gina, I have a simple system really. I’ve always wanted to have a better art database, but so far this works for me. I either scan or photograph each of my pieces at 200 dpi at full size. Then I need other sizes for other purposes, like a smaller 72 dpi version for showing on my website, and then a thumbnail version to place into my inventory sheet. I keep these in my artworks folder on my hard drive. The inventory sheet shows a list of the paintings delivered to the gallery with a thumbnail of each one beside its description and price. I make two of these sheets — one for the gallery and one for myself. The duplicate that I keep gets the gallery’s signature showing that they received the work. I save the digital version of the inventory sheet on my computer in a directory that I’ve created for the individual gallery. The hard copy goes in a physical folder with all the other paperwork for that gallery. The galleries appreciate this instant documentation, even if they go ahead and create their own at a later time. How do you handle the sides of the canvases Martha. Is that a later step? Martha, these have great yummy textures. . . any clues as to how you did these or are those secret? #2 down on the left and the one with the text in the center are immediately getting my attention! Vikki – I paint the sides either black or a color that coordinates with the painting. For a while I would tape the sides securely, then leave the wood showing. But then I would have to paint the wood with a protective clear finish anyway. All the above choices work. The smears and occasional drips down the side are inevitable as the piece develops, but I like to have it gone when finished. Mary, I use everything but the kitchen sink, literally. 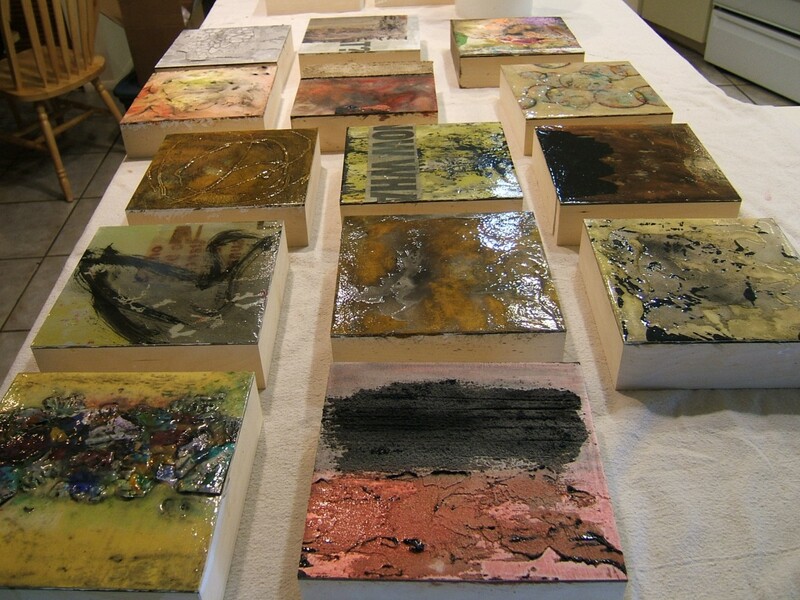 A lot of stuff is buried beneath gesso and glazes and gels. I like all kinds of textures, so I try them all. If I like one that I’ve bought commercially, I then try to find a way to duplicate it cheaper. John, that’s fun to know which ones catch your eye. The one with the text has changed some. But you’ll see!